My husband Paul and I recently took a road trip through Oregon and Washington to visit potential colleges with our son Gabriel, a junior in high school. We gleaned what we could from the blur of campus tours, info sessions, and landscaped grounds dotted with blossoming cherry trees. As a brilliant student and captain of his high school tennis team, he will have many options open to him. In some ways, that makes this pivotal life choice even harder. And the decision seems like a big responsibility for someone who has trouble remembering to bring his jacket home! In any case, the most important aspects of a college experience aren’t quantifiable, like the student-to-faculty ratio or the number of Nobel Prize-winning professors. Rather, they are intangibles such as who you become over those four years, the lasting friendships you make and the foundation you build for the rest of your life. View from the trenches: a campus tour of Reed College in Portland. As a curious nine-year old, Gabriel introduced me to the possibility of infinite parallel universes. (See my 2012 blog post, Parallel Universes.) So in this world he will eventually choose one school, but I like to think that all the other options are playing out in other universes, each with infinite variations. Somehow that takes the pressure off! And then there is the experience of our daughter Maya. After touring a dozen colleges in five states, applying to eight, negotiating financial aid and scholarship offers, and much noisy agonizing, she finally settled on the University of Puget Sound in Tacoma, Washington. We breathed a collective sigh of relief that the long search was over. Or so we thought . . . In a plot twist, after two extremely wet and cold winters there, last summer Maya opted to transfer to Humboldt State and live at home. Though HSU may not have the cachet of a private school, it is strong in her chosen field of art education. And here she enjoys a semi-private apartment, home-cooked meals, and the stunning natural beauty of Humboldt County. As surprised as we all were by this turn of events, she is much happier here. We love having our lively and affectionate daughter around again—and her tuition is a fraction of what we were paying! It goes to show that you can do tons of research and make the best decision with the information you have, but no one can predict how life will unspool. I take comfort in the fact that Gabriel is a wise and perceptive young man, so I know he will make sound choices for college and beyond. As for me, my Stanford degree in international relations prepared me well for my first career in international development. For my unexpected second career as a working artist, not so much. The five(!) economics classes I endured were chock full of theory. But other than that bit about supply and demand, they were useless on the topic of running a small business! Who knows what discoveries await my children in college, and which universes they will go on to explore? Although part of me would like to keep them home forever, I’m also excited to see how their futures will unfold. It was still winter at Crater Lake, Oregon, where we stopped on our college road trip. New Cards for Moms, Dads and Grads: I have designed six new cards for Mother’s Day (May 13), Father’s Day (June 17) and graduation, plus birthdays. You can find them all in the Cards section. ukiaHaiku Festival: The ukiaHaiku Festival takes place this Sunday, April 29, at the Civic Center in Ukiah, California. Awards at 2 p.m., reception and refreshments at 3 p.m. 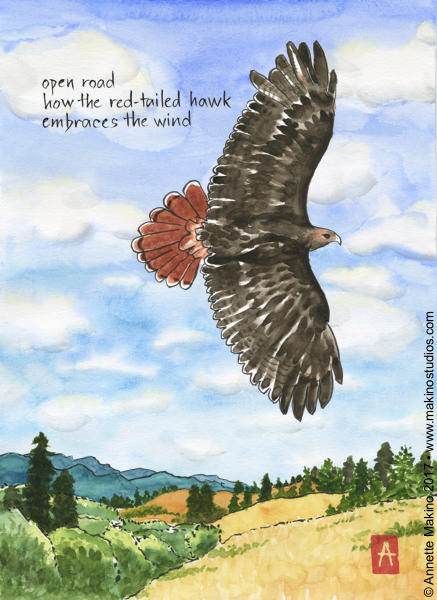 I will read a winning haiku and have cards and prints for sale. Open Studios: I will join artists Tina Gleave, Jennifer Rand, Amy Fowler and Araya Shon at the Samoa Women’s Club in Samoa, California for Weekend 1 of North Coast Open Studios, June 2-3. This is the 20th anniversary of this fun, free annual event, when more than a hundred Humboldt County artists open their studios to the public. Our daughter started college this fall. Before it happened, I couldn’t fully understand how much lies behind that simple statement—hope and excitement for your child’s future mixed with worry and sadness at their leaving. For weeks after we dropped Maya off, the smallest thing could bring me to tears, like measuring oatmeal for three instead of four. My husband, son and I all miss her effervescent spirit, affectionate nature and hilarious observations. She has left our home quieter, tidier, and less exciting. It seems unfair that after eighteen years of the hard work of parenting, now that she’s pretty much perfect, she’s gone! But happily, I got to visit Maya at the University of Puget Sound in Tacoma, Washington earlier this month. (In a sweet bit of synchronicity, my freshman roommate at Stanford lives ten blocks from campus, so I also got to visit this dear friend.) To my delight, Maya decided to accompany me to the Seabeck Haiku Getaway. For four days along beautiful Hood Canal, fifty poets talked, wrote and shared haiku, and I enjoyed giving a presentation on the process of creating my haiga (haiku art). As ever, it was a fun and inspiring retreat, and there was even time to hike through the woods and soak up sunlight by the lagoon. Haiku ahead! Annette Makino and daughter Maya at the Seabeck Haiku Getaway, October 2015. Back in 2013, when I returned from Seabeck, I created the “leaf light” piece above based on a forest trail there. Thinking about Maya’s leaving, it is a reminder to have faith in times of loss, change and uncertainty—and to keep walking. 2016 calendar: A wall calendar of art and haiku, featuring twelve of my paintings of landscapes, animals and flowers, is now on sale in stores and online. From ocean waves to oak-covered hills, this mini-calendar provides a monthly dose of Zen wisdom. New cards: I’ve posted eleven new and updated card designs to the MakinoStudios Etsy shop and they are also available in stores. Made in Humboldt: More than 50 card designs, plus prints and calendars will be offered at this holiday sale at the Garden Shop of Pierson Building Center in Eureka, CA Nov. 17-Dec. 24. Connecting: I appreciate the kind responses to my last post, “One brushstroke at a time.” You can also get news, art and haiku on my Makino Studios Facebook page and my Twitter feed. "leaf light" has been published in The Sacred in Contemporary Haiku, edited by Robert Epstein, 2014; and in the 2013 Seabeck anthology, A Warm Welcome (it is also used for the cover art). When I was in college, I sometimes felt overwhelmed by all the problems of the world. Hearing that a child dies of malnutrition every thirty seconds, or that one and a half acres of rainforest are lost every second, I despaired. In the face of so much suffering, ignorance, fear and greed, I wondered how I could possibly make a difference. And I wondered what career to pursue where I could best solve these problems.